I want to wish each and every one of you a wonderful, prosperous and profitable 2013! December is always WILD – with the “Christmas Crunch” of quilts for customers and for the family, holiday preparations, travel, parties, etc. Now it is January and things usually slow down a bit. 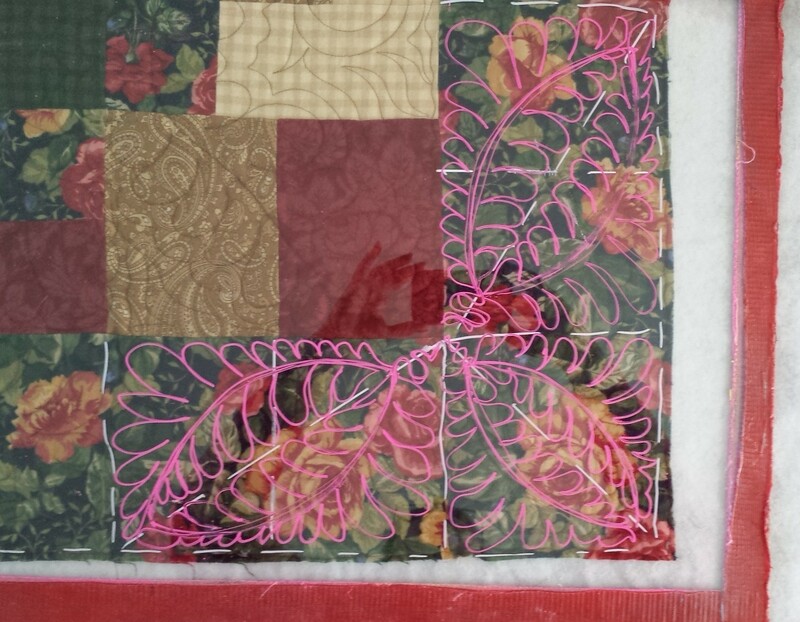 During this slow(er) time, take a break from quilting – if only a day or two. Work on some of your own projects or maybe do some piecing. Take some time to clean your studio and maybe even your house (gasp)! Next to your quilting machine and your quilting supplies, your computer is probably the most important tool you have for your business. Think about everything that is stored on your computer. For your business you have your accounting information, checkbook and savings information, your customer contact information, photos of the quilts you have done for customers, and much more. If you have a computerized quilting system, think of all the patterns you have on your computer! For your personal life, think of what you have on your computer also – family photos, family financial records, recipes, the list can go on and on. Have you ever thought what you would do if you LOST everything on your computer? I am a huge believer in off site, secure, “whole computer” backup sites. I have subscribed to Carbonite www.Carbonite.com for the last four or five years and I HIGHLY recommend them. Carbonite automatically backs up ALL the data on your computer when your computer is not being used. I feel that backing up your computer routinely is CRITICAL in having a business. Even if your business is only a few quilts per month, you need a back up system of some sort. I know several quilters who say they have an external hard drive attached to their computers and it backs up their computer once a week or so – or maybe even every day. But what happens, God forbid, if something happened to your house and your computer? I live in an earthquake area and my house is older. If there was an earthquake and my house was destroyed, my computer will be destroyed also! I have friends who live in wild fire zones. If their house is burned, so is their computer. We all think we would have warnings that something catastrophic is about to happen, but we don’t. Or, we may have warnings, but we think the event won’t be as bad as it turns out to be – think Super Storm Sandy! Here is my own personal story about computer back ups. Shortly after subscribing to Carbonite, my computer got a virus and died! The hard drive had to be wiped clean and EVERYTHING on my computer was lost. That included about 10 years of financial records, for both personal and business. I was devastated! Then I remembered I had Carbonite and was able to restore EVERYTHING!!! I do have a lot of stuff on my computer and it did take 5 days to restore it, but, it ALL came back. I did have to re-load the programs, but that was easy! Then, in 2012, I had not one, but TWO computer melt downs, one in September and the other in December, and it was the same story. The hard drive had to be wiped clean to fix one meltdown and my hard drive had to be replaced on the second melt down. Carbonite came through both times and restored everything! While my computer was in the “hospital” getting fixed, I was able to go to Carbonite, find the files I needed, and easily and quickly download them on to my laptop. Yes, I am probably sounding like an advertisement, but having Carbonite in place has saved me a TON of grief and frustration. Not to mention the time involved in trying to re-create everything that was on my computer! I know the Carbonite is not the only “system” out there. You will have to do the research and find out which one works best for you and your computer. Yes, there is a yearly fee involved ($59 per year for Carbonite – less than $5 per month) for this type of service, no matter which system you have. And this fee is a legitimate business expense. So, start the New Year off by getting an off site back up system installed on your computer. You will NOT regret it! Don’t just think about this – do it NOW!! If you have a different system than Carbonite, please let us know what it is and include links. And, tell us about any computer melt down experiences you have had.